In the description of his 2015 book, African Americans Against the Bomb: Nuclear Weapons, Colonialism, and the Black Freedom Movement, historian Vincent Intondi describes the long but little-known history of black Americans in the Nuclear Disarmament Movement. His essay, which appears below, tells the compelling story of courageous black activists who connected the fight for racial equality with the campaign for the elimination of nuclear weapons. In 2005, I made my first trip to Hiroshima and Nagasaki with American University’s Nuclear Studies Institute. Up that point, most of my career as an academic focused on African American history. Nuclear disarmament was simply not on my radar. However, that changed when I set foot in Japan. After meeting with atomic bomb survivors (hibakusha) and learning about what the United States had done to the people of Hiroshima and Nagasaki, I knew I could not return home and ignore how I felt about nuclear weapons. I began thinking about how I could combine black history with nuclear disarmament. To begin, I asked one question: What did African Americans think about the U.S. dropping the atomic bombs on Hiroshima and Nagasaki? Finding out the answer to this question began the journey that ultimately became the book African Americans Against the Bomb: Nuclear Weapons, Colonialism, and the Black Freedom Movement. When I started this project, many expressed doubt that I would find much on the subject. Colleagues argued that African Americans were too focused on trying to gain their own freedom and equality and simply did not have the time to worry about nuclear weapons. However, a little-known story about Malcolm X was the first piece of evidence I found that proved they were wrong. On June 6, 1964, three Japanese writers and a group of hibakusha arrived in Harlem as part of the Hiroshima/ Nagasaki World Peace Study Mission. Speaking out against nuclear proliferation, the group traveled to at least five other countries before reaching the United States. However, traveling to Harlem was the highpoint for the hibakusha, who were thrilled at the prospect of meeting Malcolm X.
Yuri Kochiyama, a Japanese-American activist, organized a reception for the hibakusha at her home in the Harlem Manhattanville Housing Projects. In an effort to make the hibakusha’s wish come true, Kochiyama contacted Malcolm’s office months before their arrival, but received no response and remained doubtful that Malcolm would attend the reception. Shortly after the reception began, there was a knock at the door. Kochiyama opened the door, and there stood Malcolm X. Malcolm told the hibakusha, “You have been scarred by the atom bomb. You just saw that we have also been scarred. The bomb that hit us was racism.” He went on to discuss his years in prison, education, and Asian history. Turning to Vietnam, Malcolm said, “If America sends troops to Vietnam, you progressives should protest. America is already sending American advisers.” He argued that “the struggle of Vietnam is the struggle of the whole Third World: the struggle against colonialism, neo-colonialism, and imperialism.” Like so many before him, Malcolm X understood how these issues were related. He knew the issue was not civil rights, but universal human rights. 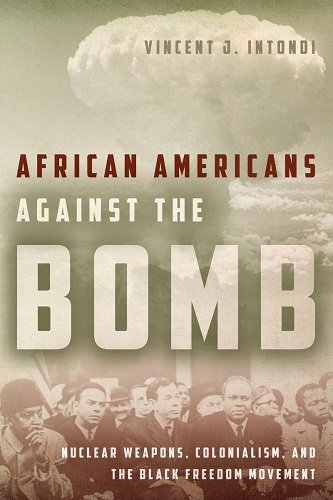 African Americans Against the Bomb examines those black activists who fought for nuclear disarmament, often connecting the nuclear issue with the fight for racial equality and liberation movements around the world. Beginning with the atomic bombings of Hiroshima and Nagasaki, my book explores the shifting response of black leaders and organizations, and of the broader African American public to the evolving nuclear arms race and general nuclear threat throughout the postwar period. As word got out that I was writing the book, many who were in the fields of nuclear studies and African American history asked why? I always looked at Black History as a giant brick wall that we are still trying to fill in. There remains much to discover, research, and write to complete the narrative. I viewed my work as one missing brick in this wall. For too long scholars have failed to appreciate the black freedom struggle’s international dimensions, viewing slavery, Jim Crow, and the Civil Rights Movement as national phenomena. Because of the understandable focus on African Americans’ unique oppression, historians have often entirely ignored them when addressing other important issues, such as the nuclear threat. This has begun to change. The past two decades have seen a rise in new scholarship that challenges the accepted narrative of the black freedom movement. Historians have begun to rediscover the forgotten history of black Popular Front groups, CP and labor organizers, as well as anticolonial and peace activists. A number of these studies suggest that the black freedom movement’s origins date back to the 1930s and 1940s, were much more global in scope, and were influenced by those who consistently combined their plight with those seeking peace and an end to colonialism. While scholars have provided a valuable service by shedding light on these connections, many fail to appreciate the role of nuclear weapons. From 1945, the bomb is what, in many cases, connected various groups and individuals inside the black community. Nuclear disarmament was a main part of the platform at the Bandung Conference in 1955. In the middle of the Civil Rights Movement, Bayard Rustin led a team in Ghana to stop the French from testing a nuclear weapon in the Sahara. A year later, Kwame Nkrumah, joined by African American activists, held the “World Without the Bomb” conference. Dr. King began connecting the nuclear issue to black freedom as early as 1957. Therefore the role of the bomb is essential when examining the length and scope of the black freedom movement. Setting out to research this topic, I found myself spending countless weeks in the basement of Swarthmore College’s library with its Peace Collection. I began to look for answers to a number of questions: Did African Americans respond differently to the atomic bombings of Hiroshima and Nagasaki than did other Americans and, if so, to what extent was this related to the fact that the first victims were non-white? Did African Americans’ discrimination-induced estrangement from American life allow for a more critical attitude toward the Cold War in general and U.S. nuclear policy in particular? Did the left-oriented social and political activism inspired by black Popular Front groups translate into a broader critique of U.S. militarism and foreign policy, both of which were undergirded by the American nuclear arsenal? As I researched the Fellowship of Reconciliation and the work of Bayard Rustin, I would be pushed towards the War Resisters League then to Women Strike for Peace and so on. A challenge of this project was making clear that nothing was monolithic. I was examining leaders: both men and women, ordinary individuals, members of various organizations and religions. Therefore, while African Americans immediately condemned the atomic bombings of Hiroshima and Nagasaki, not all of these activists protested for the same reason. For some, race was the issue. Many in the black community agreed with Langston Hughes’s assertion that racism was at the heart of Truman’s decision to use nuclear weapons in Japan. Why did the U.S. not drop atomic bombs on Italy or Germany? Hughes asked. Black activists’ fear that race played a role in the decision to use atomic bombs only increased when the U.S. threatened to use nuclear weapons in Korea in the 1950s and Vietnam a decade later. For others, mostly black leftists ensconced in Popular Front groups, the nuclear issue was connected to colonialism. From the U.S. obtaining uranium from the Belgian-controlled Congo to the French testing a nuclear weapon in the Sahara, activists saw a direct link between those who possessed nuclear weapons and those who colonized the non-white world. However, for many ordinary black citizens, fighting for nuclear disarmament simply translated into a more peaceful world. The bomb, then, became the link that connected all of these issues and brought together musicians, artists, peace activists, leftists, clergy, journalists, and ordinary citizens inside the black community. As I wrote the book I was always conscious of readership. I sought to thread the needle between the academy and mainstream readers. I thought of a student who would read this book because of their love for African American history only to learn about the intersection of race and nuclear weapons. Conversely, I hoped someone interested in the peace movement or nuclear disarmament would learn about those who are rarely discussed outside of Black History and see that they too were fighting on this front. In a broader sense, all too often we are taught that humanities and science are mutually exclusive, which could not be further from the truth. African Americans Against the Bomb explains how the fight for freedom, coupled with the desire to avoid nuclear annihilation, blended together and united human beings. Connecting racial equality to nuclear disarmament and colonialism broadened the black freedom struggle, specifically the modern Civil Rights Movement. The black freedom struggle cannot be properly understood without exploring antinuclear campaigns. African Americans’ views of nuclear weapons directly influenced their response to other international issues. My hope in writing this book was that I not only added to the rich body of scholarship dedicated to African Americans and global affairs, but altered the way in which we discuss these subjects. Vincent Intondi, African Americans Against the Bomb: Nuclear Weapons, Colonialism, and the Black Freedom Movement(Stanford, California: Stanford University Press, 2015). See also Brenda Gayle Plummer, Window of Freedom: Race, Civil Rights, and Foreign Affairs 1945-1988 (Chapel Hill: University of North Carolina, 2003); Robbie Lieberman, Anticommunism and the African American Freedom Movement (New York: Palgrave, 2009); Mary Dudziak, Cold War, Civil Rights: Race and the Image of American Democracy (Princeton: Princeton University Press, 2011).